My name is Scott Gilbertsen and I am the second cousin of Mike Gilbertsen, who posted in 2009. 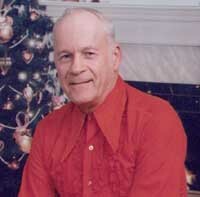 My grandfather is Ralph Gilbertsen and Mike’s uncle. Ralph’s father is Hans Gilbertsen. I would be very interested to hear from anyone who remembers any of the above people, especially Hans and his wife Ragna. My wife and I will be in Minnesota next week and hope to get up to Pine River. Anyone who has information as requested above may contact me at my email address of sctsfishin@gmail.com. What is Pine River Backus High School doing right? With under 200 students, this little school wins many awards in choir, band, cross country, football, and basketball. People went on to be Leaders in the community, music industry, pro football players, and singers. Many students excel in teaching or the sciences. Pine River is in Northern Minnesota. Many upper class families move within 20 miles of Pine River for early retirement for the pine forests and pristine lakes. Notable attendees include Ron Stark (Pro Kicker for the Colts) Thomas Greip (Music awards in CA), Gloria Gensmer- Felthous (Pine River teacher) and Thomas Knutson (Fortune 500 computer engineer). Ironically all four came from the same class of 1975. But the list does not stop there. In fact that list just scratches the surface. I would argue the leagacy continues to this current day with several Pine River Backus High School graduates earning the Bridges Career Academy Awards in 2013. I suggest you take a closer look at the past graduates, and what they have become. Pine Rive Backus High school delivers a deep history of achievement. Question for anyone I am Gale Morganroth and I have emailed back and forth and added to the PR guestbook…..have a question for John W (or whoever knows the answer) One of my memories of PR was the Pfieffer Drug store and the soda fountain counter. I know that the store ceased being a drug store but also heard that someone may have been trying to refurbish it and retain the counter. Just wondering if that has happened…going to come to the class of ’63 reunion and would like to get a 5 cent cherry coke. Yah right. Answer: Gale, you have heard correctly! A group of sisters has combined their efforts to revive and restore the soda fountain of your youth! You can order a cherry coke (no they are not a nickle anymore, sorry! ), a lime phosphate, a malted milk in made in a steel cup and even a hand made pizza (you couldn’t get them back when you were a kid!) The place is now called Ole & Lena’s Sweet Revenge and you will enjoy visiting there and seeing all the historic memorabilia displayed on the walls and on the counter. The Class of ’63 will defintely have to check it out! Who could help identify the people in this photo? We have memorbila for the family of Eric & Erica Raymond including pics, postcards, property deeds, etc. Sure would like to give them these wonderful items. I’m trying to research Agnes Livingston and Paddy Livingston. There are several references in the guest book that I can see posted by Lars Kjellberg, however there seems to be another posting that isn’t viewable. Is there any way that you can send me a copy of that post? Agnes Livingston is my aunt and I’m trying to locate her family. I moved to PR with my folks in 1950 and I dimly remember (or think I remember) that there was a bandstand in the field in front of the High School. We went to concerts there and was wondering if someone else may remember it. I would like to make contact with one the people who left a guest entry. His name is Mike Gilbertson, he left an entry in the Guest Book Sept. 25 , 2009. Would any of you happen to have his e-mail address or ask him to contact me. I was good friends with his Dad and their family. Quality Manager Arizona Industrial Hardware, Inc. I had forgotten to send in the picture of the PR Lady of Lourdes Catholic church provided by Larry Wannebo (thanks much). And thanks also to Tom Schuster who provided wedding pictures of the interior. Was heartwarming to see and remember both. First of all, thanks to John Wetrosky for the conversation when I passed through PR this July on a our home tour. John – I did have supper with Larry Wannebo at Norway Ridge supper club (pretty much as I remembered it from long ago) and passed on your hello to him. On with more interesting PR stuff. I have been digging through old pictures and found the attached one of the Land O Lakes creamery in PR, with the old butter churn lying out front after being taken out. When my dad was the manager of the creamery they made butter in that churn and packaged it in 50 pound boxes for shipment. I expect some went to centralized locations like Brainard for repackaging into the smaller grocery store sizes, but also remember riding with my mom out to Breezy Point (when it was just a resort lodge) hauling those large boxes. Assume they then used them to make their own sizes for dining rooms and kitchens. As a kid watching the churn go around was something awesome. And now…..all gone. I just ran across your website on Pine River. My dad was Norman Gilbertsen, one of six brothers – sons of Hans & Ragna Gilbertsen who lived just north of town, off 371, in the 1920s & 1930s. 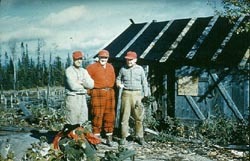 The other brothers were Ralph Gilbertsen, Lloyd Gilbertsen, Einer Gilbertsen, Melvin Gilbertson, and Harold Gilbertsen. My mother, Irene M. (Shiffer) Gilbertsen lived with her sister Eddie, and ran the Lake Region Hotel with their mother (my grandmother) Rachel Shiffer. I recently ran across these two picture post cards of the hotel. They may be something you already have – but in case you don’t, I thought I’d pass them along to you. Feel free to use them in your historical collections and/or websites. My wife and I still have land on Long Farm Road, east of town. Having grown up with my parents, and around my uncles & aunts, I have a very special feeling for Pine River. The country is beautiful any time of the year! I always feel the presence of my many family members who grew up in the area and it has that special feeling of being home. Hi, I was looking at the posting on the site. What a great Idea. I made it back for the 45th class Reunion August 14th Janis SatherlieAllen and Jeanette Weise Smith did a super job of organizing it for the Class of ’64. Thanks Donna Gard Abear for all your work also. We had 33 classmates attend. My husband and owned a dairy farm in the rural Pine River for 15 years. We have 4 children, two boys and two girls. Gayle, Dean, Debbie and Daryl. In 1983 we moved to the Upper Peninsula of Michigan. I live on the south shore of Lake Superior known as Keweenaw Bay. It is a beautiful spot. In September of 1991 my beloved husband passed away. I have worked for Michigan State University Extension of 24 years as the Baraga County 4-H Youth Program Coordinator. I have 12 grandchildren (8 boys and 4 girls) ages 4 to 16. My oldest daughter, Gayle lives in Alabama, My sons, Dean, Daryl live here in the U.P. and my youngest daughter, Debbie lives south of Grand Rapids, MI For our 50th Class reunion I will be putting together a Power Point of what our class has been doing. Please email your stories and photos. Does anyone know how to contact Vickie Bogel? 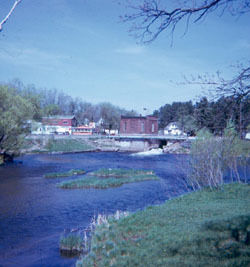 Will you place this photo on the guest book area of the website showing the river and the old damsite / A&W store. I remember spending summer days at the Pine River Swimming Area and was neat to see a picture of it from back in my days. Does anyone remember when the power house was taken down? I am looking for anyone that may have pictures of the old Pine River High School in the 1950-59 time frame, and of the older Lady Of Lourdes Catholic church (not the current brick one but the frame one around the street). I am trying to put together an album from that era of my life and would appreciate any pics that could be emailed to me. Thanks a lot. I first came to Pine River in the winter of 1947 with my parents, Homer and Gail Kipling, and my older sister, Verna to visit my Uncle Rollin and Aunt Florence Herzog. We were staying with them for an extended period so I was enrolled in Pine River School and my sister, Verna, got a job at the bank. Pine River was hit with a boatload of snow and as my Uncle and Aunt lived out in the country, Verna and I were snowed in in Pine River. We checked into the Pine River Hotel and I have to tell you it was wonderful. The couple that owned the Hotel were wonderful people and took great care of us until my parents were able to get to town. They moved into the Hotel also and the 4 of us stayed at the Hotel for the rest of the winter. My Dad went to work at Durkee’s saw mill and it was a great little town. My sister dated the high school coach but ended up marrying the town barber, Lowell Klein. Verna ran the bus depot and she and Lowell lived in back of the Barber shop/Bus Depot. My parents and I went back to Iowa but came back to Pine River often (every time my Dad got 3 days in a row off, we headed for Northern MN. We lived in Burlington, IA). Spent a lot of summers there and went to school there again in 9th grade as Verna was expecting their first child and we spent almost all winter with her and Lowell. Still tell people how we were allowed to leave school and attend our own Church during school hours. Came to school and saw kids with frostbite on their legs from standing out waiting for their school bus. Brutal winters but I loved the dry, fluffy snow. Made many great friends there throughout the years….especially Diane Boehme. She had four sisters. Can’t remember all of their names but Joanne Boehme became a nun, if memory serves me correctly. I I visited Diane and her husband when they were first married and living in Illinois. Lost touch after that and would love to hear from her again. Mandy Amy was one of my sister’s best friends so spent a lot of time with Mandy and Clark when they owned the newspaper. Visited often with a wonderful older couple named Balzley (hope I spelled it right). They had a beautiful lake home on Ponto Lake and were lovely hosts. Loved playing basketball in high school. The girls played basketball during lunch hour every day. Swan at the dam every day in the summer. Never did get up the nerve to jump (let alone dive) off the high platform though I could swim across the dam. Spent many a summer day sitting on the steps by the swimming area of the dam. What a wonderful town. People were so friendly. Last saw Mandy Amy and her daughter, Allison, in August of 1987. My sister, Verna, died that fall. A tremendous personal loss but you lost a real advocate for Pine River. She loved that town! I went to a dance at the armory in 1955 or 1956 and ran into Bill Hall. Had known Bill and his cousin, Bob Hall, when I went to 9th grade. Also remember Carol ?. She had an older sister, Joy. Joy had bright red hair and Carol had coal black hair (may have been part native American). Really a nice gal and had a great personality. I have many, many memories of Pine River and a lot of pictures from various areas around there. My husband and I had planned to retire in the area and in 1989 bought a beautiful home on Gull Lake just off Highway 371 but sold it in 1991 when our oldest daughter became seriously ill with cancer and had a baby a year old. Knew she would need us and didn’t know how often we would be able to get to Pine River from St. Louis. Remember fishing with my Dad and Lowell on many of the lakes around Pine River. Cold summer mornings and warm, beautiful afternoons. Came back so often it always seemed like my second home. I dream of the area often and live with many good memories. Thank you for your website. Saw so many ex-graduates of Pine River but none from class of 1955 (my age era). Hope someone sees this. I wanted to add this note to the history section but got a server error so will try this way…….. I lived in PR from 1950 to 1959 and my dad ran the Land O’ Lakes creamery. I remember the Marlow Theater, the A&W, swimming at the dam, homecoming parades, the old high school/elementary school, the year the streets we dug up for the sewer lines (that was a big deal), and Christmas decorations hung across the downtown main street. We lived on Norway Brook and dad built a small dock on it so I could fish – and he enjoyed the building of it. I remember after we moved in to our first real house, dad did some brush clearing and decided to burn the pile. Of course, the fire got away and the fire department arrived to hose it down – and when they left dad was a member of the PR Volunteer Fire Department! I remember climbing the water tower at night with friends since it was the highest point around for miles. And playing on the big sawdust pile at Durkee’s (?) in July and finding snow under layers of sawdust. I remember driving back a number of years ago with a pathological need to walk through the old high school only to find it totally gone. 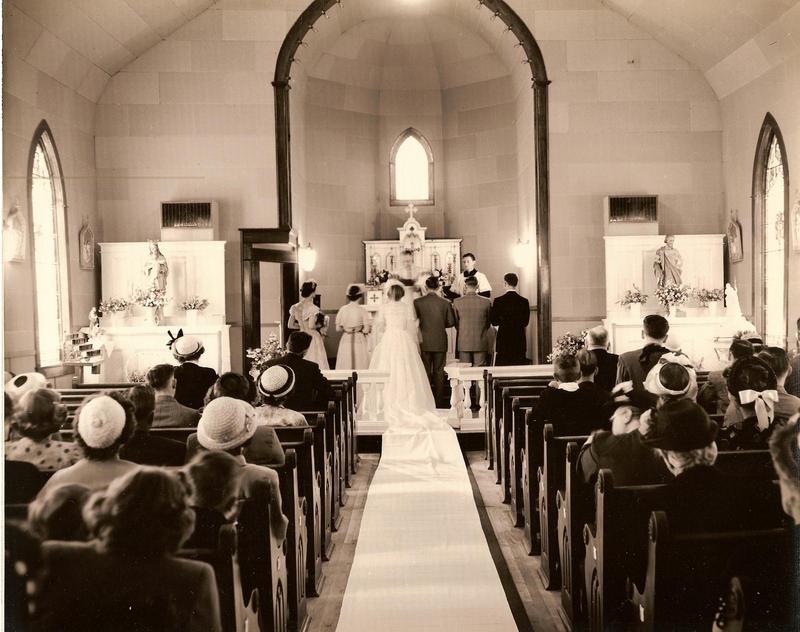 I was an alter boy at the Lady of Lourdes catholic church and started in the old frame built one around the corner from the present one….having to slog through the snow from the back to the front of the church during Easter masses was a real treat. The last time I drove through town was in 2006 and unfortunately it was a Sunday morning, otherwise I would’ve stopped at the old Pfieffer Drug Store for a coke at the counter. I am amazed of what has gone and come for Pine River, but nearly 50 years and 1500 miles away here in Connecticut, I still remember that town and still talk (e-mail) with former PR people. Why is that? I would guess that most of the people of my generation reading this know the answer. Was thinking more about the Pine River Watershed and the definition of “clean” water”. Clean is good, but “safe” is another important factor. That made me wonder how much sewage, pesticides & even some kinds of fertilizers get into the PR Watershed? I don’t know how much is known about the exact sources nor the precise amounts that enter the various streams, which substances are bad and which aren’t so bad, nor the restrictions. I suspect there’s still some disagreement about the effects of pesticides, for example, between say some farmers and some fisherman (of course many people being both). Also am curious how long it takes various poisons to “disappear” or “dissipate”. When someone in Backus pours a gallon of drano down their kitchen sink where does it go? Do any of the poisonous molecules ever reach Dingpot? Last summer I was chatting about the source of rivers with a Gift Store owner in Hanibal, Missouri on the Mississipp River. He said they get more tourists from MN than any other State except MO. He had a big frog in the front window as Mark Twain’s first story was The Celebrated Jumping Frog of Caleveras County. I mentioned the strange “mutated”? or deformed frogs that were found in southern Minnesota a few years ago and the theory that it might be related to pesticides seeping into the frog waters. He assured me that scientists subsequently determined that wasn’t the cause. Now I think I better do a little more research, & “field work”, so I know what I’m talking about. Reminds me of hunting frogs on Norway Brook with bow & arrow, though probably only got about four. Also recall catching several large turtles, putting a few in the bathtub, and releasing them in good health with their horizons broadened. Last week at the pet shop in Har Mar Mall in Roseville MN they had some big new turtles that appeared to me to be the same species (not Snappers) as those on Norway Brook last century. Thanks if you read this far & have a good day! Hi – This is Gale Morganroth out in Connecticut, I have contacted P.R. people via the website and other means, and have a favor to ask. My dad ran the Land o Lakes creamery in town and I am looking for any pictures of the creamery or the feed store across the street. I sent in via Larry Wannebo a while back a video of old 8mm film taken in the 1950’s but was wondering if other pictures exist and if people could share them. A follow-up to Karen Starks guest book memory of Feb 27th…… As I remember, a good thing about going to 6th grade over in the armory is that we did not have to walk the two blocks from the main school over to the armory for hot lunch. Wasn’t a long walk but in the winter it could be an adventure. The meals there were….basic. We used to kid that the food was U.S. Army surplus – from WW-1, but in eating the hamburger gravy on mashed potatoes with bread, I think we got a lifetime of starchy foods in one grade level. In addition to H.S. basketball games in the armory gym, in the 50’s there was also the #1 indoor Minnesota sport – Professional Wrestling!!! I remember the days of Vern Gagne and the crew of bad guys who’s names escape me now, but I do remember a match between a good guy and a bad guy (we booed loudly), and then after the match the same two guys were walking out of the armory talking about their families like old friends, which they probably were. Pro wrestling took a nose dive in my book then. Thank you for the reply to my e-mail regarding the Guest Book. I attended 6th grade in Pine River back in 1952. The class was held in the armory, which I understand is no longer. Through the Guest Book I was able go re-connect with former classmates. Mrs. Seaton was my teacher and Mrs. Malmo was the other 6th grade teacher. I have only fond memories of my year in Pine River. It was and still is a friendly town. Every close community (such as Pine River is) should have a GUESTBOOK! Lots of wonderful memories coming up to Pine River and staying at the Schlapkohl family farm. Our family would come up many weekends and I absolutely loved being up there! Hi to Vaughn, Bonnie, Craig, Mitch, and Mona. What an incredible family, and incredible memories. Pine River was one of my best childhood memories. I have been coming to Pine River, and Lake Ada ever since I was baby. My grandfather started coming up here in the 30’s and staying at Dream of the Northwoods on Lake Ada. After that my family use to stay at Ada Pine Beach. Now I have been lucky enough to have my parents buy a cabin in the west side of the lake that we have had for the past 8 years. Just making the drive to Pine River and on to Ada puts a smile on my face and runs chills down my spine. It is our little piece of heaven, and although I have many working years left I can’t wait to retire there. I’ll be stopping at the Pinewood Cafe in two weeks for a fantastic breakfast. Looking for information on: John Bergquist, died 1971 Agnes Berquist, died 1973 Alice Livingston, Agnes daughter. Just read about Steve Crandall’s passing and echo Tony’s rememberances about the old PR days when we all managed to survive growing up. My memory of Steve is when we were around 13 and we (and the usual gang of suspects) would climb the water tower and stare down on our home town…seemed a lot bigger back then. Just got a bit smaller. Meet ya down by the river Steve – some old day. It made me sorry to read recently in the Pine River Journal that old PR elementary school mate & Cub Scout Den mate Steve Crandall passed away. Ron Turner asked for fond memories from elementary school: In 1954 our PR 4th grade class drew names for Christmas holiday presents. Steve drew mine & I received a very cool, cherished, horse racing game from which we learned the names of classic American racehorses Seabiscuit, Citation, Count Fleet, Gallant Fox, Twenty Grand, War Admiral & Whirlaway. Steve also told some very good jokes for a 4th grader. I passed his childhood home on the corner many times on the way to the bakery. Thirteen years later, by coincidence, we were in the same summer Spanish class at the University of Minnesota in Minneapolis where we helped one another learn a little Spanish and mostly catch up on Pine River news. Condolences to Steve’s family and friends. Vaya con Dios Amigo. BEHOLD! My e-mail address. Can anyone tell me about the “Progress and Promise” happening in our fair, but small city? Here’s a fond memory from elementary school, are ya ready? How about that chocolate milk every Friday at lunch time? That was great! It may have gone down hill from there. If you can refresh my memory of any other such bliss it would be nice to hear from you. Class of ’87 rules! Well there you have it. My father was raised in Pine River. He was in the class of 1936. We will be travelling to Minnesota this year. We attended an all school reunion in Pine River several years ago…and Dad really enjoyed the visit. We haven’t heard anything about what is happening back there and would like to know. My Dad is full of stories about his growing up near Blind Lake and all the miles he walked to go to school. Good to hear from you! You may be lucky to be alive as a lot of my Dad’s patients have passed on! The only pool hall I recall seeing in PR was while peeking downstairs from the main floor of the Marlow. Remember the temporary cotton candy operation set up by the Marlow lobby? Remember your PR teachers…can you name them? The foot bridge below the Dam? (I’m working on a novel based partly on old PR memories.) Sheriff Buck Simpson demonstrating how his bloodhounds worked to us kids on the Old School Football Field? Scores of marble players in the school yard during lunch & recess? MULLANE, Elaine (Kargel, Prigge) passed over on April 26, 2006 after a brave fight with cancer. Elaine was born to Russell and Eva Kargel on April 18, 1948 at the family farm outside of Pine River, Minnesota. Elaine moved to Tacoma, Washington with her first husband (Jerry Prigge) and their son Jeff in 1966. In 1970, Elaine and Jerry were blessed with the arrival of their daughter Kimberly. In 1971, Elaine and Jerry divorced. In the fall of 1981, Elaine met the love of her life – Chip. Elaine and Chip were married on March 8, 1984 at Fairchild AFB, surrounded by her husband’s co-workers and her daughter Kim. Elaine and Chip were committed to each other through all of life’s challenges and enjoyed tremendously their time in their garden, refinishing their house, and spending most weekends fishing, camping, hiking, hunting or cross country skiing. Sadly, their goal of celebrating 50 years together will have to wait until Chip joins her in Heaven. Elaine is survived by her husband Chip; son Jeff Prigge and his wife Chris; daughter Kimberly Akins and her husband Chris; grandchildren: Sydney and Madison Prigge and Hunter, Cameron and Chloe Akins; her sister Marlys Anderson and her husband Tiny; her brother Eugene and his wife Florence; and numerous nephews, nieces, cousins and in-laws. To all that knew and were touched by Elaine’s sense of humor, her warm touch and her professionalism in helping those less advantaged, Elaine wishes you only good things for the rest of your life. ………if my memory serves me rightly, wasn’t your dad one of the PR doctors ??? If he was, I remember the night my folks took me to the clinic sick with a stomach bug and he attempted to examine me with a tongue depressor. My dad warned him that it wasn’t a swell idea, but he insisted and as a result think I left an outline on the wall behind him. He was cool about it and changed clothes and finished the exam. AS for the Marlow, I know I learned how to play pool near there, but wasn’t the pool hall below the theater at first and then moved up to main street alongside the Marlow? Yeah, still think of those days and wonder how I survived them. I don’t know as my parents moved from Pine River after my 4th grade in ’55 & took me with them kicking & screaming. I think some grades moved to the Armory shortly after. I think my uncles were taught by Seaton (not Bill) & Malmo & there was also a Mrs Grundy too who taught 5th a/o 6th. I was told she expected us to know all the State capitals so that was something to think about. Of course Thea Lundrigan & Mrs Flategraff were teaching middle grades too. My main Armory memories are the A & B squad Tiger basketball games. The B squad usually made the A squad look like the Minneapolis Lakers. I attended 6th grade at Pine River in 1952-53. Was your 6th grade class held in the Armory and did you have either Mrs. Malmo or Mrs. Seaton for a teacher? Hi old PR grade school classmate from 1950-55! Last summer your name came up during the Summerfest Parade during a brief meeting of at least three former elementary school mates. I also stopped at the drug store soda fountain & remember many of the movies at the Marlow. For at least one Saturday matinee I recall being admitted for a Mercury Dime with a penny left over for a fair sized tootsie roll. Also recall school field trip to creamery where your relative(s) worked? Also, last week at HarMar Mall in Roseville MN I stumbled into John Cartright’s Railroad Art booth. He sketches & sells portraits of old Minnesota railroad depots, some in color others black & white. He knows a lot about the subject and draws from old photos. He has Pine River (with a couple businesses in the background), Pequot, Jenkins, Walker…was talking about Backus & Hackensack & Ah-Gwah-Ching…I mentioned Mildred’s “depot” that I said it was about as big as his booth & he is looking for a photo! He’s out of Shoreview MN. I am the daughter of Fred Olson who grew up in Pine River. My Uncle is Frank Olson who still resides on their farm. Haven’t seen him in awhile, but plan to visit soon so he can meet my new husband Charlie. I have very found childhood memories of going to the farm to see Grandma and Grandpa Olson, and my Uncle Frank and Uncle Walter, Aunt Dorothy and Uncle Vic Hedlund, and all the Hedlund cousins. Hope to visit soon. I am writing in this guestbook on behalf of Cecelia, Rachel, Phil, and I. We are trying to locate every classmate from 2001, so that we can start figuring out the plans for our first reunion. We had talked about having a get together this summer, since it will be 5 years. WOW, Time sure flys when your having fun, RIGHT! So, if you read this please feel free to email me back with your information and let me know what you think about having a get together this summer, and what you think about the reunion plans for our 10 year reunion. Hope everyone is doing well! Although I only attended 6th grade at Pine River, I have many fond memories of that year. My teacher was Mrs. Seaton and both 6th grade classes were held in the Armory. Am wondering if the Armory still stands? The two teachers at that time I attended 6th grade were Mrs. Seaton and Mrs. Malmo. Ardith, Inez, Merle, Karen, Maxine, & Ruth were a few of my 6th grade classmates. Sorry I do not recall their last names. I will be in the PRB area in April ’06 and would love to visit with old friends while I’m out there. I attended PRB School for the ’93/’94 school year. I made some good friends who I think of often. If any of you who were my pals come across this message, please email me. I would love to hear from all of you! I hope everyone is well. I have never lived in Pine River, but have gone thru there a few times. My Grandfather William Kinkle died September 12 1928 at Norway Lake near Pine River. He belonged to the Baptist Church in town. He lived at the lake for 8 years. Also, I believe there were 2 other people living close by and their names are J.C and Martha Young. All are gone now, but if any one reading this heard of the Youngs I would appreciate hearing from them. I am doing a family tree and cannot find anything about the Youngs. Martha was born in Le Sueur Minnesota and died somewhere in Minnesota. I hope to go up to Pine River this summer. It is a beautiful town and has some memories. Thank you for this site. My wife Nancy and I have been coming to Pine River since 1956, to her folks lake cabin on Blind Lake in Blind Lake Township, 20 miles NE of Pine River. The lake is an old logging lake and some of our property had the railroad access rail line spur to the lake from the old grade trail line which went north and then south to Brainerd. There once was an old hotel on the shoreline where the train cars were loaded, when we first arrived there was still the old footing of the building, there are still pine poles in the lake where the logs would be gathered to be loaded on the train cars. Another area on some of my other property was the livery stable and the blacksmith shop and water well. We have found may artifacts buried around the area; ox hoofs, horse shoe, pike pole, pulleys etc. We also have a spot on the land where the loggers stayed, it is an earthen mound which was the lower side of the wood shack they made to sleep in, you can still see the dirt box type outline. We enjoy the atmosphere when we arrive at the Lake Place and it’s fun for all of our families including our grand kids. We hope that the Lord blesses and keeps watch over Pine River and everyone. We just recently moved in to the Pine River area from East Gull Lake. We purchased an older home 2 miles west of Pine River on Cty RD.2. The home is pictured on page 155 of the book Logsleds to Snowmobiles. It was a home that I believe was originally part of the Spurriers land development. I was wondering if anyone might have pictures or interesting history of this home or the buildings around it. I would be very interested to find out as much as I can. What a wonderful web site! I enjoy reading it as often as I can. I am thinking about retiring in the Pine River area to be closer to my grandchildren. Just reading the comments from the town people and well as people who have moved from Pine River make me think I am making the right decision. Please feel free to e-mail me, so I can feel like I know other people in PR, when I come to visit. One more time, I stopped in PR last September to snoop around the old home town – was a Sunday nite and waasn’t much to do but walk around main street and peek in store windows, was relieved to see that the Drug Store is still intact – spent a lot of time at the soda fountain. I know a lot of things have changed in both the town and me since the 60’s but gotta wonder why the old Marlow movie theater was never rebuilt. That place, and it’s 15 cent Saturday matinees, was sure an early part of our lives back then and wonder if anyone else remembers it. Hello PR-B Class of 1996!! I am planning our 10 year Class Reunion for next summer and need some help in finding addresses for all the graduates. Please send me an email with your current information. Or if you know a graduate of 1996, please pass this information along to them. I can’t wait to see everyone! I just thought that I’d drop a quick line to the class of ’04. You know, I tried so hard to get out of that little town three years ago and now all I’m trying to do is get out of college as quick as I can so that I can come back to the beautiful scenery. You never really realize what you’ve got until you don’t have it anymore. Crookston just doesn’t have many trees and the lakes for those of us who love them. My mother was born and raised in Pine River on a farm. Her parents, my grandparents, were Fred and Anna Wasyliuk. They raised 13 children on their farm 2-3 miles outside of Pine River from c. 1930-1965. 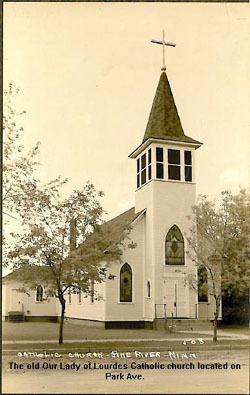 My mother attended the Pine River Schools from 1944-1956 or so, and attended the Ukrainian Catholic Church and the Greek Orthodox church during the same time period. My mother’s name is Nellie (Wasyliuk) Anderson. Hello 1965 graduates of PRHS. Disappointed to have missed the all school reunion in 2005. I wanted to go see all the “old” people who were there from the class. I work for the MN Dept. of Health in the Bemidji District Office, have 3 grown children and 4 grandchildren. I thought life was supposed to be slow and boring when we “grew up.” HA! My brother Jerry Morrow and I (aka Dora Cloud) attended the all school reunion 2005. It was great to look in on the variou classes especially ’68 and ’69 as lotsa my buddies hail from that class. I looked in at the Methodist Church and watched the parade. Terrific. It sure was great to chat with my foster family and fellow cheerleaders and choir members. I have been in Minneapolis and lived in Seattle for many years. Since I work mostly for government agencies I decided at this time in my life to find my “roots”. So I work in Cass Lake at the Leech Lake Tribal Police Department and live in Bemidji. I have my daugher 25 and youngest son 16 here and my eldest 33 is in Seattle (he won’t move back to cold & hot Minnesnota). I have many fond memories of Pine River. Go Tigers!!! Greetings to all who attend this year from the class of 1945 I am not able to attend but was wondering if any of my classmates are somewhere in Oregon. I sure would like their addresses if there is any one out here. I am fine. Widowed and as yet in very good health. I am retired but keep very busy with traveling, my three children and their spouses and five grandchildren. I would like to hear from some of my old classmates. Have a great reunion and hello to all. My parents and I, plus a lot of relatives, vacationed every summer at Lake Ada, north of Pine River. We rented cabins at resorts on the lake: Old Point Comfort and Whispering Pines Resorts. This was the late 1950’s right through the 60’s — at least 10 years or more. We had wonderful, happy times there. And we would go into Pine River to buy groceries, bakery goods, the laundramat, and stop at the hardware store — they had a wonderful gift section, and also the drug store on the corner with it’s soda fountain. We went to Mass at the Catholic church on Sunday. Pine River is my very favorite small town, and that whole area brings wonderful, happy memories to me. I have written about our days at Lake Ada. The memories will never fade. It was a happy time and a beautiful place. I am the grandson of the late Paul and Emma Lindberg! I am glad I came accross this site. Thanks! Hi to everyone from Class 2004!! Miss you guys a bunch, hope to see you all soon again. Miss my good friends Angela, Precia and Sara!! I will come back to visit like promised. I was just surfing the net to find the Pine River paper. I was unsuccessful. I have family near Pine River and visited last summer, and plan to come this summer. I enjoy the beautiful area. The fishing was also good last summer. Like a lot of Pine River residents, we have a Backus mailing address. My husband Tom, oldest son and I moved to Pine River in 1988. The people in Pine River are very friendly. I got to know a lot of them through working with or for them at different businesses and by shopping locally. My husband and I have 4 children. Thomas is 17, Chris 16, Carmen 15 and Cassandra 13. They all attend the Pine River High School. They are involved in different sports and music. I have visited Pine River and love the place! My mother-in-law lives in Backus. I plan to visit again in September of this year and I plan to walk the trail. I’ll see you all later this year. I am planning to attend the All Class Reunion in June. I would like to hear from anyone from the class of ’39. I am trying to locate all my classmates, so please, anyone out there who knows one, tell them to write to me. Thanks and see you in June. I am Mildred Kyllingstad Morgan. I graduated from PR in 1934. I and my sisters, Mardelle(’39), Audrey(’43), Carol(’41), Eva and possibly Eleonore, will attend the ’05 reunion. I will enjoy hearing from anyone who remembers the Kyllingstad girls. Hello Class of 84! Just came across this cool website and it brought back lots of old memories. I hope to find some old friends. I just retired from the Air Force, have 2 boys and settled in Rome, NY. Well Tara is my cousin and Becky is my aunt, lol! Mary, my grandmother as well. I don’t think they will see this, but HI all the same. I remember playing in the barn when I was yay high, (holds his hand out) milking cows. That didnt last too long. The many hours of hide and seek, and then there were the family reunions! I think there were 4 generations at one time or another and I believe there will be again. Enough food to feed a small army, and you couldn’t help but try it all. I dont think I will ever have as memorable a time other then when im spending time with my family Pine River! Hello! 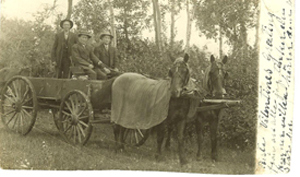 My mother’s family grew up and around Pine River dating way back to pre-1900s. When I was just a little girl I visited my grandparents, Lillian and Orman Stanley for a summer. I remember some of the places mentioned … and last summer my husband and I visited again. So many things have changed … and yet, everyone we talked to were friendly and accommodating. I’ve been searching for my great grandfather’s parents “forever” … does anyone know of Adolphus D. Stanley and his wife, Fidelia??? Very long and sad story; when Fidelia died in 1900 … Adolphus never remarried. Both are buried in LaPort, MN. If you have any information or are related … as most of the Stanleys in the area are, please contact me via the above email! Thank you! And I hope also that even though Pine River continues to expand, it never looses that “homey” feel! My grandparents lived and died in Pine River. I truly think of it as their little piece in heaven and, I think they did as well. I remember visiting for summers and how relaxing and fun it was to be in the North Woods. To me Pine River will always hold wonderful memories of summer and family fun. I was raised in Pine River and my Grandmother was Beaulah Gard. Many people knew her. Pine River is a special place for me and my family. I will retire in PineRiver. Some readers might have known my stepfather Donald Tuott. For those who knew him, he passed away on Febuary 1st of 2005. It good to see the Guest Book and all of the old friends in it. My years in Pine River were short ones but I will always consider it home. I hope that all of my classmates and friends will send me a line. I live in the Twin Cities and still have the family place in Fifty Lakes. Hope to see everyone at the reunion and take care! My parents and I used to have a cabin on Wabedo Lake. Late 50’s to late 60’s. We would go to Pine River frequently for groceries. Wonderful years. I noticed in the guest book that people are looking to find agates. We did that for over ten years down what was called the old grade road. This connected Longville to a highway (Crow Wing Co. Rd. 1) that could take you to Cross lake. The road grader would go through and bring up rocks and we found a lot of agates over the years. I don’t know what exactly has happened to that road but I would think any dirt road that has gravel would find anybody the agates they are looking for. Dad polished them too and we made jewelry out of the small ones. Good luck! Readers of this guest book have lost a good friend in the passing of Loren Sowers in Missouri. Loren was 93 years old and loved to use his computer. You’ll find several of his letters listed below along with some vintage pictures of Pine River. Our sympathy to Loren’s family and friends. My family has two cabins up in Pine River on Norway Lake. It is the coolest place to vacation. Most of you might know my grandparents, Robert and Dee. My Mom sent me a brochure on the “all class” reunion. Until then, I didn’t realize Pine River even had a web site!!!! I graduated in ’80 and have plans to come home for the “all class” in June. I have been living in Texas since ’92. I have worked in the Corrections field since ’95, and in March of last year I was hired by the Tarrent County (Ft. Worth) Sheriff’s Dept., where I work as a jailor. Quite the surprise to all of you who thought I’d marry one of the local farm boys and raise football players. ( No offense to those who did!) I’d love to hear from anyone in my class. I’ve lost touch with almost every one. Sharon Velsvaag lives about 45 minutes south of me in Waco, and I’ve called her a few times. I’d really love to make some contacts before the reunion!!! Hi! I don’t live there, but I will be soon enough. I have been to the area many times with the love of my entire life, as his family has a cabin on Hand Lake. He and I are going to be coming up there and really beginning our life together there. I am very excited for all of the opportunities to become part of the community and the opportunities that abound it seems in means of employment. It is a great area and I am more than excited!! Thanks so much for a great site for a great area! Hello Class of ’95 and to all other classes. I just got some information on our class reunion and I am very excited about it. I can’t wait to see you all in June. Take care! Hello, I’m not from Pine River but would love to make it my home in the very near future. When I was younger (much) I would always go camping with my grandparents to Pine River and we would always stop at Pauline and Erv Griep’s home. They were my Great aunt and uncle. I see by the website the jewlery store is still going strong. Plus, since then my family has vacationed in the area many times. So, if any of the Griep family read this, hello from Linda (Hendrycks) Paggen. Hi to all our classmates from 1967. For those who do not know, Jim Filibeck and Thelma McClintock were married September 26, 2003. After not seeing each other for over 30 years, we connected through Classmates.com – the rest is history! We live in northern Alabama, and plan to stay here for a long time. It’s great when you can golf almost year ’round! Thelma has lived in AL for 16 years, and Jim came to live here in February 2003. We are looking forward to the All School Reunion next summer and hope to see everyone. We would love to hear from everyone! I had fun scanning the guestbook. I graduated with the class of 1964. I would love to hear from Linda Dirks. I have been in touch with Eunice (Dabill) Beacham and Carol (Erickson) Kalmbacher. I haven’t been to a reunion since our 30th. We had our 40th this fall but it was scheduled the same weekend as our sibling reunion at my house, and we scheduled ours a year in advance. It would be fun to come back but it seems I don’t get to PR anymore. My husband has a bad back and is very uncomfortable travelling very far. I have a sister, Leanne Laubenstein, and a brother, Merlin Johnson,in PR. Also my brother, Gary, is near Cross Lake. I have lived in the same house in Oskaloosa for 36 years. My husband is a farmer (semi-retired from that) and manages rentals. Would enjoy hearing from classmates. I saw Alan Johnson’s picture on the website. We were in the same class. My wife Paulette and I just discovered this website and enjoyed the comments made. We recognize many of the writers. I taught school (Phy-Ed and Health) in PR from 1948 to 1967. ( I was also a football and track coach for many of those years. We look forward to visiting with our friends at the 2005 “All School Reunion” this coming summer. My Grandfather Jake Huffman and his wife Lorena came to Bungo Township in a covered wagon and ox team in 1886. Warren raised buffalo in Bungo in the 1930’s and 40’s. Pine River was their trading town. They raised a family of 4 boys and 2 girls. The girls: Annie (My mother) Rachel Boys: Frank, Ralph, Warren, Jim. I left Bungo in 1923. My half brother, S/Sgt Hubert Bolon was killed in the Philippines in 1945 and is buried in the Veteran’s Cemetery at Pine River. I retired as Chief Deputy Sheriff of Cook Co. Minneseta 1969. I am living in Rocky Ridge Manor, a Rest Home in Mansfield, Missouri. I enjoy E-mail and invite anyone to write if they care to. I just moved back to this area and would like to say “Hi” to all my classmates from 1994. I saw some of you at our class reunion in September. I just wanted to know who all lives in the area. E mail me. I would love to hear from you! I would like to say hi to the class of 89′! I’ve lived for the last 10 years in Germany and I’ll be moving back with wife and kids to the Pine River area. It would be helpful if people could keep an eye open for house to rent and good used (household stuff) to sell when I come back. I’ll have nothing and it would be nice to get alittle help. THANKS TO ALL! P.S.I’ll see you in FEB. 2005 take care! Hello, I went to Pine River school from 1st grade- 6th grade. Just wanted to say Hi to all my friends from Class Of 1995. Hi Hope, Shari Joenks, Tammi Carlson, and Carla. Our reunion is around the corner! Here is a list of classmates I do not have contact information for. If you know where to reach them, please contact me. I grew up with summers in the Pine River area staying with my grandparents, George and Mary Mekola. I have nothing but great thoughts of summers spent there in the country and swimming at the dam in town and going out for ice cream. Now almost all the grandkids are grown and my grandparents are starting to welcome their great-grandkids. The first from my brother Ashley came in November of 2003. Dylan George has been the pride of our family for the past year and sure to be forever. I went back this last September to see them and see the town and it has changed so much since the last time I had been there. I look forward to bringing my children there when they come into this world to show them where I spent parts of my summer when I was a child. Hello to the class of 1950. When we had our reunion in 2000 we talked about getting together again in 2005. Is the interest still there? Let me know if there is interest so we can start planning. Well, I only went to Pine River High School for 2 years and I didnt move very far away, but the city has become a different place since I lived there. I graduated in 2000 and spend too much time working, so feel free to contact me. Just wanted to let people know from the last time I posted here that my email address has changed. My family is from Pine River. I am the grandaughter of Herman and Clara Weiss and Florence and George Prigge. My Papa Weiss owned the Shoe Shop across from the Red Owl in town until my uncle Richard took it over and then sold the property. My roots are in this town. I started my education at Pine River with Principal Rinke and his daughter was in my class. My uncle owns property where the river meets the lake and those are very cherished memories. Both of my grandfathers are gone now, but I still remember Pine River as my homestead. I am now a nurse and cry alot with the dying, wishing I was back where I grew up on the quiet shores when life was carefree. Memories and history hold me there happily. Keep it beautiful! Hi there everyone! Just chilling in Iowa… I graduated from the class of 2002… and I’m just checking on everyone that’s around… If anyone Iknow checks out this message give my e-mail a jingle. I lived in Minnesota for about half a year and I loved it! I really want to move back but I can’t. I’m just looking for some old friends of mine. I’d love to visit with Olivia, Rohana, Mindi, Zach Humphrey. There were alot a people, but that’s all I can remember. My step-brothers are Corey and Ryan McKeever. My husband and I travelled 1400 miles one way from SC to pick up our new camping trailer at the Scamp plant in Backus. We arrived a day early and our trailer wasn’t ready, so we had to stay overnight to pick it up the following day. My husband found a golf course, and I proceeded to explore the town. Beginning with the cafe on Hwy 371, I had a delightful bowl of chicken and dumpling soup, as good as grandma makes. I, then, wandered into the information center where two ladies glowingly shared all the nuances of their beloved hometown including the free camping area provided by the city! I perused through every store and establishment where shopkeepers were friendly and helpful. All told me about the up-coming festival on June 25-27th. I sat by the river and read while watching a father bring his son to fish with him. We camped in the city park where a city employee came by to replace a light bulb and offered a bit of town history and to do whatever he could to make our stay more pleasant. In the evening we walked to have pizza in town, and the next morning had breakfast at the Cottage Cafe where food was excellent, portions plentiful and service was friendly and efficient. In short, we fell in love with your little town. We have every intention of returning for a longer stay to briefly submerge ourselves in your amicable, small town lifestyle once more. Thank you for your gracious hospitality! I would love to hear from my friends, just to say hi and catch up on things, I miss everyone from Pine River so much. Hi Lara Marvin, Erica Richards, Cara Christensen, Jenny Schrupp , Katie Anderson, Mary Devorak, Kirsten Skarbonkiewicz , Beth Pryor, Audrey McCoy, Joey Bresnahan and everybody else! Hope to hear from you soon, Have a great summer and senior year! My Grandfather, Ralph Chester, owned a summer home on beautiful Norway Lake during the 1960’s and 1970’s (just beyond Pine River). I have many happy memories of my summers spent fishing on the river, spending time at the lake, and visiting the wonderful small town of Pine River. The dam swimming area and the old historic movie theatre were a true joy for my family. This is fantastic. Some times I don’t even remember what class I was in so have to call my good old HS friend John Vasecka who reminds me I graduated in 82, because he graduated in 83. Cheers to all, old and new. There is indeed something magical about Pine River, Minnesota! My family used to spend almost every weekend of the summer at my great grandmother’s vacant house just outside of Pine River on 371. Though the house is not in our family’s possesion any longer, it can still be seen nestled in a wooded area just across 371 from where the old steel bridge was located (the Emily short-cut). The steel bridge was taken out some years ago. If anyone remembers Jennie (d. 1988) and Frank Ball (d. 1973) and their children: Frank Ball Jr., Ronald Ball, or LaDonna Ball (Gardner) (d. 2002), please send me an e-mail. I had other relatives in Backus as well (Harley and Bertha Howe, Theodore Howe). A great many of my relatives are buried out at Bethlehem Lutheran Church Cemetary, which is located fourteen miles outside of Pine River on Highway 64. You take county road 2 out of Pine River going west. I will always love Pine River: the dam site, the quaint little shops, the beautiful river, and the vivid memories of my childhood. These memories will continue to inspire me and make me long for simpler times. I moved to Waconia five years ago with my family from Pine River. Waconia is a great place, but I will never have friends like I did in Pine River. Everyone is always smiling and having the time of their lives. Keep in touch, I know I will! Pine River is a town that I love and will always think of first when I think of “home”. My family and I will be vacationing in Pine River this summer (June 5 thru June 13) and are very excited to see the area and do a lot of fishing and sight seeing. I am not originally from Pine River but this is my home now. Like the old saying goes, “Home is Where the Heart is.” Pine River has taken mine. Since moving here six years ago, I find myself with more freinds than in any other point in my life. The people here are freindly for the most part and I seem to have fit in from the beginning. I’m pretty outgoing so it wasn’t that difficult for me, but for some it’s difficult coming in from somewhere else because people tend to leave you out and you remain an outsider looking in. I have seen this with some people, some of which have moved away because of it. Since I get out in the community and get involved, I am fortunate enough not to have experienced much of that. I am active in theatre, I go out on weekends and sing Karaoke at one of the neighborhood pubs around the area and I was also involved with the Jaycees until I aged out. I know quite a few people and quite a few know me. I have made some wonderful freinds here ! and for the most part am so glad that I moved here. My father was originally from Cass Lake and came to Pine River to see the movie and Roller Skate at the local Roller Rink here. My mother was from Longville and they would come here and skate and have a good time as their towns didn’t offer these things. I think if I heard right the theater burnt down and not sure about the Roller Rink. Why is it that these things were never replaced? It was my parents fond memories and a couple of my own growing up that attracted me to this town. Greetings from the East Coast. I graduated in 74 with many fond memories of playing in the black and orange “Tiger” uniforms. Anyone know the whereabouts of B. Wicklund, Jeff Long, Greg Minette, Craig Schlapkohl, the Kline brothers, Dean and Kirk Tulenchik, David Schoon, Carl Anderson, etc., please contact me via email. After spending 24 years in the USN, I retired in 99. Currently in construction. My parents, Art and Hazel Kayala, sold the family farm last fall and moved to Menagha. Lots of memories of hauling milk down to Pillager in that old red/white Ford pickup prior to going to High School. MR. Skalsky always told me that I was just like an old farmer (outstanding in my field)!! Would appreciate any shouts back from anyone from back home. Found this sight by accident. I was back home to Tiney Piney this last year was very surprised at how it had grown! I went through the halls of the new Pine River-Backus school met teachers there and had many memories come up and was able to show my children where I went to school. They thought it was cool and laughed when teachers remembered their mother. Was good to be back. Glad that I found this sight! I used to live in Pine River and I LOVE the fact that there is a web site up. Now I can still find out what is going on in the town I grew up in. And I love it! I have a new email address, so am adding a P.S. to my previous posted message. We are still trying to organize a Class of 1959 on-line reunion. So far, we have only Lorna Goldenstein, Bill Cromett, Del Birk and myself. If you are interested please contact me at my new address, and I will pass it on to the others. It really is great fun to share old memories! I just had to come back to Pine River’s web site, and thought that it would be nice if people could put their pics up somewhere. Maybe more people would recognize them, and joggle their memory a little more. Anyway, it was just a thought. Editor’s Note: I’m going to try this, but if it gets too time consuming, I may have to re-think. The only way I can receive pics is in jpeg format. We’ll see how it works out. I also have to be aware of how much space we are taking up on our server. Thank you! Where did the time go? Preparations for our 10-year class reunion (to be held summer of ’05) are underway! We are still missing contact information for many of you. If you see this message, please e-mail me at briswan@hotmail.com. During the 60’s my folks and I would stay at Old Point Comfort on Lake Ada near Pine River. Some of my greatest childhood memories are during those vacations. I’ve spoken so much of it, even my husband is intrigued. We’re going there on our vacation this year the first week of May (2004)! I haven’t been there since 1966! I remember getting up early in the morning to go out on the lake with Dad. You’d have to dress for winter in the first week of June. The fog was thick and it was very quiet. After a time, the fog would life and you’d see the lake, as still as a mirror. A beaver would paddle by and if you’d look toward shore, you were bound to see a deer. And the loons — those crazy loons. Can’t wait to hear their wails in a few weeks! And I recall, after having dressed for winter to do morning fishing, I’d be in the water with my new summer friends after lunch. I’m sure age had something to do with not freezing in that cold water! I’ve written for some information on accomodations, maps, etc. and look forward to receiving that in the mail. If anyone has anything to add, I’d welcome your e-mail. As I enjoy photography, I’m particularly interested in getting some off-the-beaten path shots! Or you can write to me at the address below. I lived in Champaign, IL, back in the 60’s, but have lived in Kentucky since 72. Shortly after dad (Eldon Basore) passed away in the 60’s, I left for the East Grand Forks area for work. I’m sure some of you remember Cheryl Basore (my sister). Mom had passed away about 10 years ago, so I’m the last living person of my parents. I’m now 62, drawing a retirement check, and plan on moving back to Pine River this coming summer of 2004 (if I can sell the house). After reading the guest book, I have recognized several names, and I would like to hear from “anyone” from Pine River area. I used to entertain in the area yrs. ago with Tom Rohr, Johnny Brinkman, Sonny Rudlang and there were probably others too. Anyway, I wanted to let people know that I still think of Pine River as home. Hoping to hear from someone. Hey, Class of 1959! We are trying to organize an on-line reunion. So far we have Bill Cromett, Lorna Goldenstein, Del Birk and myself. If you are interested, please email me, and I will pass your addresses on to them, too. This is great fun. Hope I hear from you! I would like to find where to get information about a book entitled “From Logsleds to Snowmobiles.” I believe it was written or published about 1979. There may be an update of it and I would like to find information about it also. It has considerable information about a great uncle and aunt, and their family. Hello! I would like to hear from friends in the class of 80. My Father, Jerry Prigge (Gerald Dennis Prigge) who Graduated in 1964, was killed in a tragic motorcycle accident, near his home in Washington State on September 6, 2003. I would like to hear any stories you may have about him growing up in Pine River, or any thing you would like to share about him and my mother Elaine Kargel. Hey y’all! I’m Greg Minette’s daughter, living down here in Missouri. I was up there in June-July. I come up there and vist my dad every summer for a few weeks. “Pine Cone River” was just as friendly as it ever was. I saw the pictures on the main page and it looks very nice up there, with all the trees. But Missouri is still green, so it’s all gravy! I’m currently sitting in the middle of the Kuwait desert. I’ve been in the Marine Corps since I graduated from good ‘ol PRB in ’93. I deployed to this wonderful little sandbox in January and am looking forward to leaving in a few days. I was wonderfully surprised to find this website and it was nice to recognize names of old friends. I will be coming back to town for my wedding to Susan Tulenchik on Sep. 20th. I was lucky enough to be able to travel the world over and still come back to “Tiney Piney” and find the perfect woman. Unfortunately, I was unable to attend my 10th class reunion due to the fact that I was flying missions over Iraq as a “Huey” door gunner during Operation Iraqi Freedom at that time. Susan and I hope to see some of our old classmates at the wedding reception being held at the VFW. We will be ready to have a good time and catch up. Please email us and let us know what you are up to. See ya soon! I lived in Pine River when I was younger and I lived off of Mill Street and I believe the house I lived in was haunted. We had ghost sightings for years and then we moved south. Is there any mysterious stories of Pine River? 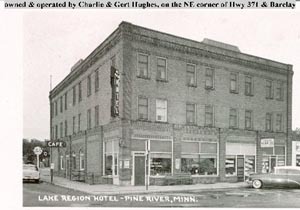 The founder of Pine River, George Barclay, was murdered in his own hotel! There must be some stories about that event. I’m a bush league rock hound and I heard today the Pine River area can be a good spot to find agates. Does anyone have information relative to this? Is there anyone in the area that would perhaps be willing to talk to me about this? My 12 year – old nephew & I just bought rock tumblers, and we are looking for an area to pick agates. Any info. would be appreciated. If you ever get a chance, you must canoe down the Pine River. I have gone 3 times and each time is a new adventure. Bring 3 things: Patience, Sunscreen, and a cell phone. Believe me, it’s an adventure you’ll remember forever. Speak with John Wetrosky at the Pine River Information Center before you put your canoe in the water. If you don’t, you might not get back. Enjoy and have fun. Hi there, Pine River ! It’s been a few years since I’ve lived there, but still have the fondest of memories. I am curious though, if anyone has a lead on a 20-year reunion for the class of 1983? I haven’t seen anything posted for upcoming events. Anyone had contact with Linda Cadwell? Any information is greatly appreciated! I am looking for any info on the Robideau family that lived in Pine River area. My grandfather’s name is Howard Robideau. I left a message before and gave the wrong e-mail address. Here it is again annemariezenk65@hotmail.com I’m also looking for pictures or info on George,Ben or Peter Robideau Thank you! Hello there class of 1993! We are looking for any of you interested in having a reunion in June. We already have some of your addresses, but we are still looking for some of you. Please email or call me so we can send you out something about the reunion. My phone number is 218-587-4296. We look forward to hearing from you! Hi to all my classmates of 1965! I just found this website, and it was so nice to read all the messages from people I remember from PRHS days. We have lived in Alexandria for about 3 yrs. now and love it. I have attended most of the reunions but have missed seeing many of you. If anyone would like to e-mail, I’d love to hear from you. My brother Jim is now living in Alabama, and my sister Judy is still in Seattle. Bruce and I have the Allstate Insurance office in Alexandria, and I am still doing homecare part-time. We have 15 grandchildren, and 2 more on the way- those kids sure keep us busy! We love the fishing up here, and I have really enjoyed returning to the “small town” setting, after many years of living in the Twin Cities. Parsons(sorry Brian-no one can spell your name), Pete Parsons (and wife, congratulations), Mr. Skalsky (thanks for understanding that not everyone can handle algebra)and lastly Julie Fenn, I think of you often, I think of all of you often. Bonnie, I need your phone number, I still don’t write. It is wonderful to find out that Pine River has a web site! I wish that some of the people from the great class of 1951 would join the world and send some emails my way!!!!! Hi to all the old Tigers! Yea for the Orange and Black! I’d like to receive information from anyone knowing anything from the following persons and their families. I am from Sweden and I’m doing family research on relatives that moved to the US and in this case Pine River and nearby areas. The families are: Agnes Bergquist, 1885-1973, Alice Livingston(Bergquist),Paddy Livingston(Bergquist) and John Bergquist, brother to Agnes. It is interesting that so many from Pine River have obtained addresses or information from this site. Please sign the guest book so others can contact you. I like the history section of this site, I didn’t know the background of our historic town before seeing it here. Old friends are welcome to contact me in Sunny Homestead, Florida. HI CLASS OF 1984. JUST TRYING TO FIND OLD FRIENDS. Hello! I would just like to say Pine River is one of the most beautiful places I’ve ever been, along with Hackensack. Last weekend my girlfriend and I biked from Brainerd to Hackensack and I must say it was quite an adventure! I didn’t want to come back to the everyday traffic and waking up to police sirens. Up there everything is peaceful. Here, a nervous wreck. I came across this quaint little site, and a rush of happy memories came back to me. I lived, as a child, around the Pine River area for a couple of years in the late seventies and early eighties. I attended 4th grade at Pine River Elementary and spent many days after school riding horses with my neighbors, Jill and Lori Humphries. Then in the summer time my family had a place at Sand Lake, near cousins, grandparents, and aunts/uncles. What a fun time fishing, swimming, riding motorcycles, and climbing trees! Hello! I’m just looking to see if anyone would have or could find a picture of my grandfather Howard Robideaux. He lived in Pine River for many years. Any info would be great. Thank you! Information please. I have a request maybe someone could help with. My home town is Pine River. Can you put me in touch with class reunion coordinators for the 1959 class? Thank you. Found your web site. My uncle was a blacksmith in Pine River, his name was Will (or Bill) Day. I’m not sure how to find out anything about him? Can anyone in Pine River tell me anything about him? THE CLASS OF 1982 WILL BE MEETING AT THE PARK ACROSS THE DAM ON FRIDAY JUNE 28TH AT NOON TO MAKE PLANS FOR THEIR 20 YEAR CELEBRATION. ALL ARE INVITED TO PARTICIPATE. IF YOU HAVE ANY IDEAS FEEL FREE TO EMAIL ME AND PASS THIS ON TO OUR FELLOW CLASSMATES. Hey there to the class of 1992! Does anyone out there have any info on our 10 year reunion???? JUST WANTED TO SAY HI TO JASON AND LEAH GILLAND AND AARON, STEPH, AND SPENCER ROBINSON! HOPE TO SEE YOU GUYS SOMETIME SOON! If you see my mom (Elaine) could you tell her hi for me? Thanks! To those who know me in Pine River. Send me an email. Thanks! Hello Pine River! Looking for any family (descendants of Elizabeth Bryant and William Maxwell McLean) or acquaintances of Billie and/or Dorothy McLean. Both graduated from PRHS (Billie in 1942). Any information would be greatly appreciated. My mother, Patty Filsymer, grew up Pine River along with Galen, Norbert Jr., and Leander. I love coming up to Pine River to visit every chance I get. You know everybody and everybody is so friendly! Especially my Uncle Lee Filsmyer, he was always stopping in at the Ace Station for coffee. He passed away 04/05/02. I want to thank everyone in town who knew him as a friend. Thank you friends and citizens of Pine River! Wednesday, April 3 at 10:03 a.m.
Has anyone heard from Doug Birk recently ?? Doug was one year ahead of me (graduated in 1962?) and I had a recent bit of deja vu…. My in-laws in Frontenac, Minn. had found an old bayonet near their home in 1974 and had it evaluated by a state of Minnesota Historical person. We inherited the bayonet this year and when looking at the letter from the historical dept., it was from Doug Birk. Saturday, March 30, 2002 @ 4:46 p.m.
We were so excited to find a page for our small Pine River town. We are both graduates of the class 2001 and we were just wondering if anyone had any info on our first class reunion. It would be very appreciated to get a response back. Oh wait! Alicia is the class president silly. Well anyways, we just wanted to say hey to Pine River cause we love our town sooooo much!!! Keep it real Pine River! Bob and I are both in Mpls reminiscing about our youth spent at the Purple Peanut and Sparky’s poolhall and the A&W at the dam. We would like to hear from our classmates. We are happy to report that we were both at the County Fair and the age guesser put our age at 29 and we were wondering if all Pine Riverites are holding up as well. Visit our web pages and drop us a line. I am planning on a trip to Pine River in the spring. I haven’t been there for almost 10 years. My Grandma had a cabin in the area years ago, till it caught fire she then had a trailer on it and got to old to stay in the area, so she sold it in 91. I haven’t been back since. I used to visit all the time as a little girl and love the area. If you know any of the McKenna family and would like to get in contact with any one feel free to email me. My grandma has now passed away Katherine McKenna (Peterson), all her children are still around though Karen, Tom, Duane, and Tami McKenna. I’m sure someone in the area remembers them, or maybe seeing me in the area bars as little girl. I was just checking the guest book and I noticed my e-mail address was incorrect if anyone has been trying to contact me. Again, I would like to find a copy of the book which was the history of the Pine River area from 1876 to 1976. Thank you. Anyhow…I’d enjoy hearing from anyone who graduated 1964 or ’65 as those were the people I knew the best. Thanks to John and Jackie for all the work they do and have done to keep Pine River humming and the class reunions going. I’ve been overseas with a Christian Missions group the last 3 summers the reunions have been held, therefore unable to attend. Maybe I’ll be able to come to the next one…when will that be by the way? I really enjoy your website since I miss the area alot. I lived in the area for about ten years back in the 70’s and 80’s and I am looking for a copy of the book “From Logsleds to Snowmobiles” that came out in I believe 1979. Can anyone help me out? Thanks. Hi to everybody up there! I enjoy visiting the city and school websites as well as Pine and Lakes to keep up with Pine River news. Sure do miss everyone I got to know in my few years teaching and coaching at the high school, 1994-2000. Hope things are going well there now. Anyone who knows me and reads this send me an email, would love to hear from you. Hi John I just found your web sight, you have done a great job. Keep up the good work. I had the opportunity to visit Pine River the summer of 2001 with my family. Yor town is beautiful and I had a great time. I hope I can visit again! New email address. Spending summers in PR area(lake Hattie) and rest of year in WA. Just saw Clive Wiliiams’ post of August 8th – those of us who went to PR high school in the late 50’s and early 60’s should remember a Mr. Hickman who taught social studies (?) and used to bring all of those tavern type puzzles to study hall. Don’t know if that’s the Hickman family Clive refers to but somebody should be able to dig up the annual from those years and e-mail a pic of Mr. Hickman to see if he may recognize him. It’s been great hearig from all my former classmates including other grads from years other then my 1967 graduation. If there is another class reunion please notify me, I would not like to miss it! I would like to receive any e-mail adresses from graduates from the class of 1981. Anybody from the class of ’74 out there? If so drop me an email and let me know where you are and how you are doing. I am hoping you can put up this link to our reunion website for alumni to see. Thanks! I enjoyed reading the Pine River Guestbook. It’s been years since I was last in Minnesota. In fact, the last time I was in PR was for the first all class reunion! We are tentatively planning to return north to Pine River this summer for vacation. Does anyone have a suggestion &/or brochures for lodging. I have no idea what is available. We would like to stay in a “smallish” resort. I remember that there used to be several nice ones around the PR area. Anyone can contact me at my email address: harriethymer@aol.com or information can be faxed to me at my fax # 775-924-0080. Thanks — I graduated in the class of 1969;it would be fun to hear from some of my classmates. WOULD LOVE TO HERE FROM ANYBODY UP THERE MY GRANDFATHER WAS HAROLD KLINE. STEPHANIE KLINE. Would like to here from the class of ’84. Also anyone that knew me in the other classes. It is nice to see a web page from P.R. Well I sure wonder when the Robyn will get our class together again, revolution of the officers I say, Detty should have taken the office, Pirates will revolt. Pirates will revolt. Graduated from PR in 1988. Since going “online” I have watched for a site like this. Nice to come accross it. For those of you who put it together, Thanks! Spent my childhood on Mule Lake. My aunt was Rose Haggerty, a permanent residence of Mule Lake. I long to return, my heart belongs to Minnesota. We started visiting in 1945. Bless all of you. I have not been there since I was 8 (summer of 1960) My brothers and I am going to be there this August. We are descendants of James R. Kinler and Hannah McAllister. We will be looking for kinfolk in the Kinler and or McAllister families. It will be nice to return to our roots. in the world. I’d love to hear from anyone there. I used to love the Dairy Queen and Miniature Golf. would dearly love to come back. Best wishes to all. Hola! I am in the Peace Corps in Nicaragua and my sisters pointed out there was a web site..I’d like to send greetings to everyone and would especially love to hear from Ruth Ek, Lousie Standforth, and Sandra Olson…so if you read this and have time to send me an email I’d love it!! Hi there Class of 96 (Beth, Candice, Tanya, etc.) Do you remember me I was an exchange when we where at 7th grade. I had a blast staying upthere and it would be great if anyone wrote back. I have lived in Michigan since ’66,but come back to visit my Mother and relatives as often as possible,in fact we will be in Pine River Memorial weekend to visit. Will be at sister Hope Parsons. Just got my “Reunion in the Pines 2000” newsletter and found out that Pine River has its very own website!! Great. Greetings to my classmates from 1951. Harvey hasn’t looked at the site yet, but will probably want to greet his classmates also. We won’t be able to make the reunion, but I am sure everyone will have a good time reminiscing. I would have been in the class of ’64 but in 1959 my family moved to international Falls. My Dad was the railway agent for the Northern Pacific, later Burlington Northern. I loved living in Pine River as a boy. As long as I got my garden work done in the morning, the Summer afternoons were mine. Swimming if it was warm, fishing or exploring if not. I was the drummer in the band that played for the class of ’64 Senior prom. I’ve visited Pine River many times over the years as my parents moved to Brainerd after my Dad retired. Now that they have died I seldom get to Pine River. I truly wish I could be there for this year’s reunion but it seems quite unlikely. Anyone who recognizes my name, please drop a line. I love to write. This is Tammy Carlson and I am just wondering about our five year reunion. We really need to have one because I miss everyone. Well e-mail me and let me know how you’ve been and if one don’t get planned maybe we can just plan one. Can’t wait to hear from you. Hello! What a great site! I graduated in ’69. I was hoping to be able to attend the reunion this year but as schedules would have it, I can not! I hope you all have a great event! I would love to hear from some classmates! Hi there! used to go to summer camp on Steamboat Lake…the husband and I are looking to relocate in the general area, hopefully w/in a year! Nice site! thanks! S.Z. I am from the class of 1966. I was at the last class reunion and my wife Janet and I are looking forward to seeing everyone in June. Please feel free to email me. Lets start our reunion out on the web. See you there! and I can settle once and for all which was the better team. Hi, Class of 1959! I made it to the reunion 5 years ago, but will have to miss this one. I got to visit with some of you 5 years ago, but not enough of you. A special hello to Jill, Caroline, Lorna and Jane. If you make it to the reunion, and take lots of pictures….email me, because I would LOVE to get some reprints! Have fun, everybody….I WILL make it to the next one! looking forward to seeing some of you again at the reunion. I attended all of the past reunions , allclass in 1990 &1995 and all of my class of 1960 reunions I throughly enjoyed all of them. I am looking forward to 2000 even though it means I have been out of school for 40 years I can hardly believe the way the time has flown away. Ginny and I will see you then. Thanks to John and Jackie for the webbpage as well as all the work they are doing on the reunion. Hey Allen, maybe this time you won’t be laid up in the hospital. I will be attending this year. I’m looking forword to seeing and visiting with my classmates from 62. Hi To All Pine River-Pine River/Backus Alums! It’s great to see the web site being used so much! Keep it up! Plans for the Reunion In The Pines are progressing. The committee hopes to have the final newsletter out within the next two weeks. It’s at the printers. If you did not receive the first newsletter, we have a bad address. Please send us your correct address. Another reminder, if you plan on attending, please register. It makes it so much easier for the committee. Also, if you will be purchasing reunion merchandise, please do so when sending in your registration. We have to guess how many t-shirts, sweatshirts and caps we need. It’s easier if we know ahead. We have ordered 200 Tiger afghans. Hopefully, that will be enough. Thanks to all who have responded and we look forward to hearing from many of you who have not. It will be a lively week in Pine River! Hello classmates of the 1960& 1961! We hope to see many of you at the reunion. We spend most of the summer season at our cabin near Pine River—Yupp, we are retired!! Wow, I’m really starting to like this “web” thing!!! I just transfered to the St Anthony Branch Library (ST Paul Public Library) in December. This is the 8th branch I have worked at during my 32 year career with SPPL!!! Change is good. Hi to all past and present Pine River-ites. I graduated in 1948 and am anxious to hear from anyone who attended school there around that time. I have been at the last two all school reunions and thoroughly enjoyed seeing all the classmates from 50+ years ago. This is a great idea! For those of you who know my brother David Satherlie, I will update you on his battle with acute leukemia. He had a bone marrow transplant and has been in tough shape for a while, but his counts are starting to come up and he has started walking again. He will have to spend 3 months near the University Hospital when he gets out. Hopefully that will be soon! His chances of recovery have been against all odds, but he has a deep faith and many prayers have sustained him. Please keep him and his two children in your thoughts and prayers. Thanks. Hello Classmates of 1984 and 1985. We are still living in the Pine River area. There are very few that are still living in this area from our classes so we are looking forward to the class reunion and seeing some of our old friends. Feel free to email us at anytime. Would be real nice to hear from any of our classmates. I guess I’m as surprised as the others here at PR’s Web page. I graduated in 1964. I’ve been back a number of times, but always managed to miss class reunions because I’ve been lost! Through the magic of the computer era, Colleen found me! I’ve lived in Washington State for the last 34 years. I would love to hear from fellow classmates as to what’s happening. YOUR SITE IS GREAT. I HAVE BEEN GOING TO HACKENSACK FOR 25 YEARS AND HAVE ALWAYS HAD A GREAT TIME. WE STAY AT JOHNS-HYDEAWAY-BAY. THEY ARE THE GREATEST PEOPLE, WHEN YOU GO THERE IT IS LIKE GOING TO A FAMILY MEMBERS HOME. THEY TREAT YOU LIKE YOU ARE AT HOME. YOU HEAR THE SAYING THAT UP NORTH IS GODS COUNTRY. WELL THERE IS NONE BETTER THEN HACKENSACK AREA IT REALLY IS GODS COUNTRY. Hi to all my former classmates. Unfortunately, I won’t be able to make the reunion this year. I am the business manager for the vocational school in our area and the reunion falls at our fiscal year end. Hope to see some of you in early June when I will be in the area. Class of 1942, can’t wait to see all of you this summer! I am Cecilia, and I am an exchange student in Sweden this year. My parents live in Pine River (Annette and David Patterson). It is cool that we (Pine River) has a web site, this way I can keep track of whats going on there. I was in the class of 1970. Congratulations to all who went before or came after. Both of my parents graduated from Pine River High in 1941. Am now teaching elementary in St. Stephen MN. Would love to hear from friends and classmates. Hi Pine River/Pine River-Backus Alumni! This is an update on the all-school reunion. Thank you to all who have so far registered! We will be sending out another newsletter in late March with a proposed schedule of events. It would help us alot if you can possibly register ahead once you’re sure you will be attending. We need to order name tags, merchandise and supplies and need some idea of how many of each we need. If you or another classmate did not receive the first newsletter, we probably have the wrong address. We have over 4,000 names in the data base. Please forward any new addresses to us so that we can update the computer. It looks like we’re going to have quite a crowd in Pine River for the reunion. It should be a great time! Keep in touch! Hi to all the class of 1950. This is our year to celebrate. 50th reunion. If you are interested in getting together as a group during the day or getting together for a dinner party, let me know. I hope to hear from some of you soon. I am surprised that PRHS has gotten on the web. As a 1967 graduate, I remember being lucky to get the copy machines to work. I hope others will discover this site, and I could possibably refresh old memories and hear from old friends. It would be great to have contact with the past graduates and facuilty where my family and I grew up. I doubt if I can make it to the 2000 reunion, but don’t let that stop any of you from saying HI and dropping a note or two. in. I miss being there and hope I’ll be able to come and visit! I think you did a good job on showing off our small, but welcoming town. Good work! Gale M., you ol’ lost soul. I happend on this site by accident, and there you were. I GRADUATED IN 1970. SO ANYONE FROM THAT TIME PEROID. DROP ME A LINE, WOULD LIKE TO HEAR FROM ANYONE. 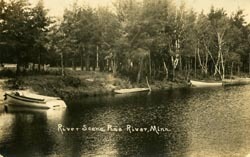 My family used to have land near Pine River. I have a lot of memories there. There was a place called Little Davies a few miles out of Pine River. Is it still there and is dave still running it? pps: How’s the fishing been? I was certainly excited to discover this website! them…also, any old busmates, neighbors, etc. great place to help re-kindle old friendships! Pine River is an oasis from the fast moving unforgiving pace of the big city. A beautiful town with parks unmatched by any I have seen. When I can’t be up there it’s nice to be able to visit this website and think about my next trip up to your area. Nice looking web page. I liked the “look” of it. I was disappointed that there was not a link to the newspaper, nor did the school have a link.